Popped out to see the 10.10 Peterborough - Lowestoft this morning and 37575 was roughly on time. Coming the other way was 37156 on the 08.30 Yarmouth - Peterborough. Subsequently Bruce texted to say "I can tell you that 37156 is out " and then Rob H did the same saying "Just following 37156" (I think he was stationery at the time). Thanks to all for the reports. 37158 was another B7 out today, but tonight arrived at Lynn on the 20.10 from Peterborough and I think was short of fuel, as 37574 replaced it on the 21.35 to Lowestoft. This had arrived on the 20.37 arrival which in the Sunday timetable (which was in operation today), doesn't go forward to Peterborough leaving a two hour gap between the 19.50 and 21.50 departures. 37579 did marginally better than yesterday, being just 20 late on the 15.10 from Peterborough. Artistic Des has been at it again - clever stuff. Not a lot to report today. 37579 on the 16.22 Wisbech to Peterborough had suffered a major delay en route and was seen on Guyhirn Bank running 39 late. Another service which was delayed was the 09.30 Yarmouth to Peterborough on which 37567 suffered a window breakage and 37577 took over at King's Lynn. 37156 & 37158 were turned out by Lynn this morning which is a little odd when B9s are spare, but this did give the chance for 37575 to receive a deep clean. New adverts today are for Internet clothing retailer Energie and the high street brand Miss Sixty. 37574 has a rear ad for Asda's new petrol station in Lowestoft and this was affixed to 37571 but was then removed. The old Easy Jet ad has now been taken off 37571 which is now entirely free of advertising. Almost at the end of a long day, our charming lady chauffeur stops for a photo with 37570 arranged by Stuart Montgomery. Peterborough Beer Festival is always a good excuse for a trip on the X1. Today I found myself with a contingent of friends at Wisbech bus station to board the 10.18 to Peterborough (L9). This arrived slightly late with 37158. There were a large number of passengers to join the already sizeable number on board. To add to the delay the driver had to activate the wheelchair ramp and in this, it must be said, he was very quick and courteous to the man involved. We eventually departed at 10.26, ten minutes late via Nene Quay and were blessed with an almost clear road all the way to Eye. With no further passengers to pick up we passed Guyhirn in 11 minutes 22 seconds, Thorney Toll in 16 minutes dead and were at Thorney Fish & Chip Shop in 21 minutes 50, the temporary lights outside the village having been disengaged for the weekend. We came to a stand in a queue for the Eye Green roundabout after 27 minutes. Here we lost about 2 minutes due to the crazy rearranged approach to the island which now reserves the left lane for Eye only. This must be frustrating for X1 drivers. We proceeded via Dogsthorpe and Bourges Boulevard and were deposited at the rail station at approximately 11.06 before the service went on to Queensgate. Considering 37158 is limited to 50mph, the driver made a tremendous effort to keep the schedule and deserves high praise for his overall performance in handling the high volume of passengers and the quality of his driving. Our return was made on the 20.10 to Lowestoft (L8) with 37570. Our lady chauffeur enquired where we had been and we made her aware which she was quite amused about. This was another fine example of driving and the higher maximum speed and superior acceleration of 37570 was immediately obvious. 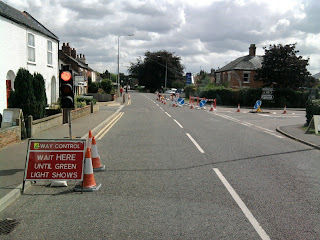 The diversion coming in to Wisbech was taken via Weasenham Lane. So two excellent X1 trips and a credit to the drivers concerned. 37567 at Norwich Bus Station today running as K4 11.50 to Lowestoft. I'm sure that lady driver looks familiar (see above). Photo from Grahame Bessey. The Norwich sun shines on 37563 as it departs on K16 11.25 to Peterborough. Photo by Grahame. Bruce kept an eye on things in my absence and although the day began as an all low floor affair, 37160 was taken off Y7 at Lynn and 20514 deputised as the 11.32 to Lowestoft and return. Des who was driving K3 had 37159 in place of the Paragon. Normally the five 'internal' King's Lynn diagrams are top priority for Lynn vehicles. K15, K17 & K19 are reserved for Lynn B9s not requiring maintenance and buses requiring examination quite often do K3 which is into Lynn around 19.00 and go out next morning on K5 which is the last turn to leave the garage. I mentioned the use of Lowestoft's 37567 on K19 on Monday and today 37566 did this turn. Next week 37571 is due to be taxed for operation from 1st September, so 20514 will probably be gone by then. Yarmouth had 37569 for pre-MOT inspection today and 37575 started the day on K4 but was swapped for 37576 at some point to enable both vehicles to have safety services. 575 has done over 220,000 miles and 576 passed the 200k mark on K4 today. K3 today was 37159 with 20514 being unusually switched on to K5. 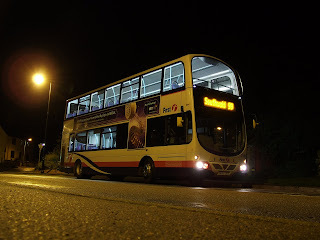 Norwich Dennis Trident 33160 was over the pit at Vancouver Avenue tonight, presumably for MOT. This afternoon services through Wisbech were running about 30 minutes down and 37577 on K17 was seen by Bruce and 37160 on K18 by Rob & Colin both delayed by this margin. Later 37159 was 15 down heading for Lynn on K3 from Peterborough to Lynn. 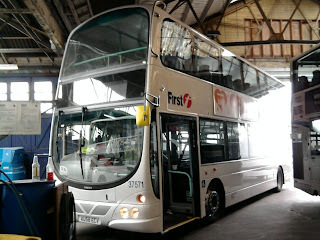 20115 at Great Yarmouth depot after receiving some attention to its bumper on Tuesday afternoon . Photo by our corresponent. It started raining at 16.00 yesterday afternoon in Wisbech and is still raining as I type this at nearly midnight. The entire rainfall expected for August has fallen within this 30 hour spell. There were several A47 accidents and delays, although these seem to have had little effect on X1 punctuality. Having mentioned that 37570 was the last bus I saw yesterday, it was then the first one espied today, seen entering Wisbech bus station about 5 late on K1 this morning. With sufficient Geminis at Lowestoft to cover, the Beast was not used on the route today and there was even a chance for 37566 to work the 10.40 Norwich - Lowestoft X2. Later this came to King's Lynn on Y7 so that 37568 which had done the first part could be taken off for a service. 37578 returned to traffic after MOT today. It took K15 15.32 Lynn to Lowestoft replacing 37577, although it is not known why this swap took place. A complete low floor day was thwarted by 20514 which was on - well I'm sure you can guess ! 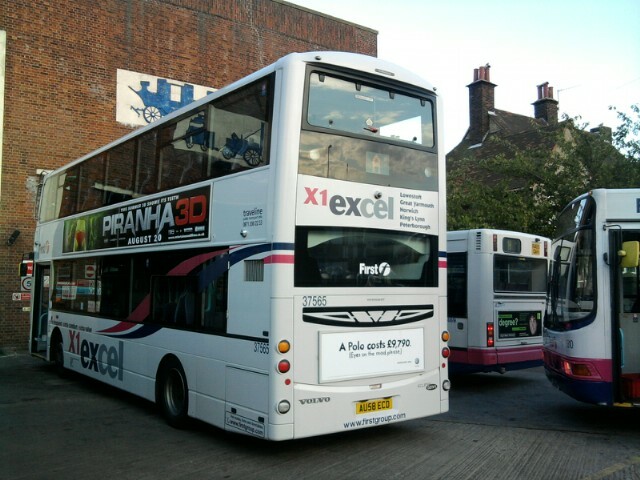 Des took this picture of a different Royale on X1 duty yesterday, but it was only doing a Gorleston to Norwich short. Peterborough beer festival is this week and tonight I paid a rather soggy visit - though the festival itself is all safely undercover of course. Earlier in the day, Peter paid a visit. He went over from Wisbech on Y7 with 37157 coming back mid afternoon with K19 and 37575. He says "I see there are roadworks in Thorney now, just on the Wisbech side of the village - well I say roadworks, there's a set of traffic lights and 100m of road coned off, but no actual roadworks ! Had that blonde lady driver this afternoon, blimey she's definitely the best X1 driver I've travelled with. Shouldn't think she is late very often". This morning at 08.30 37564 was glimpsed by Bruce on the A47 bypass being towed back eastbound - possibly to Volvo at Norwich. The bus had come to a stand near Thorney on K16 yesterday with the brakes seized on and I am told by a local driver that a wheel bearing shattered. It spent overnight in a layby before being rescued today. 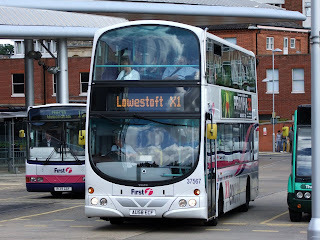 The 10.38 Lowestoft - Norwich X2 had 37156 today says Michael B, while 20107 was in charge of K2. As Bruce said yesterday "Ah Beeeeasto" (!). 20514 was K3 as usual today which once again meant that two consecutive services were coaches. Timekeeping was pretty good today but with a blip at lunchtime when 37563 on L11 and 37576 on K15 were viewed at Terrington running 21 and 26 late respectively. I went on a Towlers coach to the beerfest tonight and on the way back we departed just ahead of the final eastbound X1 (Y13). There was much amusement and for some reason loud cheers from the intoxicated participants of our coach when 37570 overtook us shortly after leaving the city. John W says " Hey Gerard, something a little odd this morning surely ? 37156 and 37157 both standing in the middle on Lynn bus station at 09.30 showing 'not in service'". Well yes John, I don't know if 37156 had been borrowed to work Hunstantons after its window repair (see Monday's blog) or if not why it was there. As for 37157, well I think a driver shortage seems the likeliest explanation for it being taken off Y9 09.45 to Peterborough. This service didn't run as a result. Obviously late running was not the reason, as 09.30 means it was in well early for the 09.45 departure. With 37157 now awaiting its return at 12.32 to Lowestoft, the opportunity was taken to remove 37578 on K4 for MOT prep and put the spare 37157 in its place. 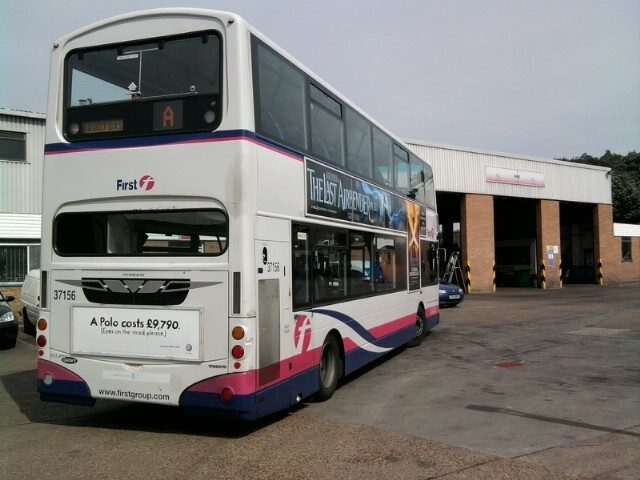 This meant that a vehicle had to be found to take Y9 to Lowestoft at 12.32 and lo and behold, a miracle, 37573 is magically returned from Volvo to do same ! It must give a glowing sense of satisfaction to the controllers when something like this happens and full marks from us here at the blog. Well you can guess what happens now can't you ? Bruce says " I can't understand it - I was outside the bungalow in view of the route this afternoon and can catagorically say that K16 did not run, we had 37567 about 13 late to Lowestoft on K14, K15 with 37576 delayed by about the same margin and then a gap until K17 with 37577. This latter turn had managed to be 26 late in both directions, so for those just missing 37576 a 75 minute wait ensued until 577 appeared. Oh Dear !" Now I can't exactly say at this time what happened to K16, but what I do know is that an X1 broke down at Thorney this afternoon and it seems almost certain that this was 37564 on K16. The nature of the breakdown is currently unknown, but suffice to say that it was sufficiently serious to warrant the B9 being towed in and this had not happened by 20.30 ! Meantime it was arranged for the spare B7, 37156 - see above if you've forgotten already - to work (empty I think) at about 17.00 from Lynn to Lowestoft to cover the vehicle shortfall caused by the demise of 37564. Meanwhile, after a quiet day yesterday, things livened up considerably today. Royale 34108 provided a pleasant surprise on the 07.45 from Lowestoft (L12), but with it being reallocated to Yarmouth in the big Royale / President swap, this afternoon the opportunity presented itself to change 34108 at Yarmouth for 'The Beast' 20107. So at 16.40 the B10M returned to its old haunts and should end up at Lynn tonight. 37563 & 37565 which were absent today should be available at Lowestoft tomorrow, so it is likely 20107 will be taken off, but you never know. As for 37564, well it could be terminal or more likely, it could be repaired and out tomorrow ! There is also 37571 which surely must be close to re-entry to service now. 20514 worked K3 today after a day off for bodywork attention yesterday. Punctuality as I've already hinted at, was pretty poor today due to the various riots. Thanks very much to Tony, Bruce, Grahame and RD for recent observations. 1). Bruce's day was made when the driver of Y7 - who shall remain nameless, but to give you a clue is a blonde lady driver who has always been blonde - gave him a cheery wave from the controls of 37578 as it passed by on Y7. 2). K14 was 37160. So what I hear you cry ? Well it just happened to be the very first time it has done this turn, now only a complete nutter like me would know that. Also Stan informs me that a very smelly passenger was refused admission to this service at Norwich at 16.55 and all the other passengers breathed a sigh of relief, praising the driver ! 3). 20115 came out of the blue to Yarmouth, in order to release 20107 back to Lowestoft for X1 standby. 34108 is now to go to Yarmouth with the other Royales. 4). Des reports new Yarmouth acquisition 34111 on the 09.00 Gorleston JPH - Norwich shuttle this morning. All four B7s were out today plodding along, 37156 on K18 was taken off at Lowestoft at 10.40 and replaced by 37157, but later 37563 on Y13 was changed and the 18.48 Lowestoft - Peterborough was a revived 37156. This turned up at Lynn in the early hours of Tuesday with a broken window ruling it out of tomorrow's early morning equation. What a beautiful morning as 37565 heads for Peterborough bang on time as the 08.30 Great Yarmouth - Peterborough. Later though it lost time on the Wisbech to Peterborough section. 37570 is easily identifiable from a distance with its rear overall advert for Bakers & Larners of Holt. Here it leaves Walpole Highway as the 17.10 to Lowestoft today. Today was a warm, sunny day and the X1 seemed to run fairly smoothly. 37567 on the 12.50 from King's Lynn to Peterborough was 14 late through Walpole, but delays seemed to be more acute between Peterborough and Wisbech. 37565 in particular lost time on this section on both the 12.10 and 21.10 from Peterborough. 37568 was the 11.05 from Peterborough but was changed at Lynn for 37572, reasons unknown. The B9 monotony was broken today by 37160 which worked the 09.30 Yarmouth - Peterborough etc. Heavy rain and strong winds are forecast overnight tonight. After yesterday's major disruption, today was better but still a poor show. Going back to yesterday first then and 34108 had found itself on K15 in the afternoon, but this was changed at Lowestoft for 37157, similarly K17 had 37578 changed for 37566. Strangely today 37566 was used on K2, a Lynn internal duty which is uncommon practice and had last occurred on 3rd July. During a spell of observation at Walpole Highway early afternoon, L12 passed by eastbound just 2 minutes late with 37563, but after this Y13 failed to run and Norfolk Green did good business picking up frustrated X1 passengers. Next eastbound was 37157 on K14 which itself was 21 late having been 15 late going to Peterborough earlier. This gave a service gap of 80 minutes which was pretty dismal for a Saturday. Seen westbound were K16 with 37156 which was wedged and running 33 late followed 5 minutes later by 37576 on K17 which was 8 late. Normal service resumed with 37160 on K18 which was 2 minutes behind schedule. 37156 did not last the day on K16 and was taken off at Lynn at 15.57 whence it retired to Vancouver Avenue. Earlier the bus which arrived at Lynn on L11 (believed to have been 37567, or possibly 34108) was removed and 37158 worked forward. It is thought that whatever came off L11 then relieved 37156 on K16 eastbound. Any observations around this time would be welcomed. The opportunity to travel behing 20514 was still an option today when it did - yes, you've guessed it, K3 ! Friday 20th August 2010 > BT Lower Line Rental, Longer Traffic Jams ! Not content with advertising all over our buses, BT caused mayhem on the X1 today. The reason being that a set of temporary traffic lights were erected by them between Thorney Bypass Roundabout and Thorney Toll and instead of employing manual operation, they were set on a (bad) timer. Enormous queues developed and some indication of delays to the X1 can be given by quoting some out and return times. 37157 which was supposed to be L12 12.35 from Peterborough was seen passing Walpole eastbound by Bruce at 15.07, a whopping 92 minutes late. Next seen was K14 with 34108 (having replaced 37564 at Lowestoft) which I saw leaving Wisbech for Peterborough just 11 late, but by the time it returned through Walpole it was 58 late. Cheryl reports seeing 37575 on K15 heading east between Eye and Thorney at 15.25 with 'Not In Service' showing and running about an hour down. Almost immediately behind was K16 with 37566. The day had already begun badly with 37156 on Y9 boiling over at Norwich at 07.50. Des (who was in charge) had to cancel the service and take the bus to Rowntree Way depot for repairs. After this had been sorted, he took 37156 light to King's Lynn where it re-entered service as the 13.32 to Lowestoft (L11). Tonight it had somehow leapt on to L10 and was apparently none the worse for its morning escapade being 3 early into Walpole Highway on the 22.10 to Lynn. 37160 which was back on its normal route today was L10 initially and L11 later in the day. The delays on the western section had a considerable knock on effect to the rest of the service and during the afternoon K18 which should be the 14.15 Lynn to Peterborough was cancelled and turned round to go back to Lowestoft on what looked like Y13 at 14.32, but with things as chaotic as they were it could just as easily have been the 14.02 (L12). Similarly, K1 15.15 to Peterborough was also abandoned and 37567 on this duty was sent back east as K14 at 15.02 to Lowestoft with Des who adds that it was 24 late departing due to the road restriction at Millfleet backing traffic to Hardwick on the inbound. Well, there were many more changes too numerous to mention and even late this evening the disruption hadn't ended. 37576 on Y13 21.50 Lynn - Peterborough was 23 late at Terrington. Of course some diagrams which were at the eastern end at the height of the debacle saw little or no delays. K2 for example with 37569 was just 2 late on the 15.45 Lynn - Peterborough, 20514 on K3 also appears to have escaped unscathed as did 37572 on K4. Many thanks to Bruce and Des for helping me unravel what actually happened. Whilst all this was going on, 37571 which passed its MOT yesterday was sidelined once again as it has no tax !! 37573 remains at Volvo workshops in Norwich and 37577 had a day off at Lynn for a safety service. There were no B10M workings today and it was left to 34108 and 20514 to fill the breach. Syd reports "After lots of false starts the swaps started today with 32210/32211 and 34112/34113 finally getting re-allocated from Yarmouth to Lowestoft and vice versa". The idea of setting up 34109 for X1 use appears to have cooled once more. The disgraced 37156 cools down at Norwich this morning. This imposing photograph of 37160 was taken at Wrentham this evening by James Race during its rare excursion to Southwold on the 99. Yesterday I went into detail about the Wisbech diversionary route now in operation and quite by coincidence, almost everything passed by my window today, indeed only four of a possible fifteen turns took the A1101 route. Special mention has to be made though of L10 10.48 Wisbech - Peterborough which surprised everyone by departing over Freedom Bridge then into the Old Market and over Town Bridge to regain the normal route, the Yarmouth driver obviously being unaware that he could have just gone down Nene Quay as normal. No surprise really then that he used the same route on his return, including the tight turn on to Town Bridge. 37570 was the bus and it was 7 late in both directions. After this there was a spell of badly delayed services, the 11.18 (L11) took the A1101 but was noted at the bus station on its return arriving 23 late with 37578. L12 , the 11.48 was 27 late with 37567 and then 23 late coming back, Y13 with 37564 was 20 late and K14 with 37157 (back to being noisy !) was 16 minutes late. Things then got back to normal with 37575 on K17 just 7 late. As we reported yesterday Yarmouth ended up with a spare bus last night and surprisingly it was Lynn's 37160 which was rested - well not exactly rested it would seem ! Syd says "I took it on the 1803 X2 from Lowestoft to Beccles, but then James took charge and used it for the 2115 Service 99 to Southwold and back and the late Bernard Matthews contract. The first instance of a KLN allocated B7 Gemini to be so used. 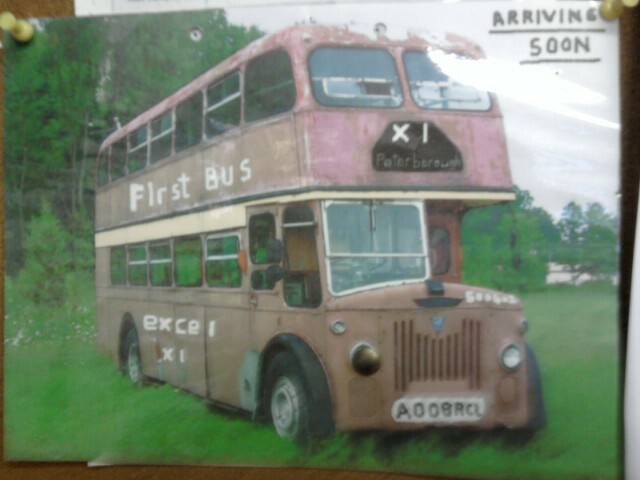 We both agreed it was a good bus and don't know why they are unpopular on the X1". Well there you are X1 people, a glowing testimonial. Finally a footnote on today. There were no changes of vehicle on any of the diagrams and regular readers will know how rare that is! One of our new readers, Paul says "Hi Gerard, have recently discovered your X1 blog. I find it very interesting, people take the X1 for granted and it's not until you read the blog that you discover all the pitfalls. Today by the way K2 was 37563 which was about 10 mins late into Lowestoft at lunchtime & K3 20514 following was also about 10 minutes late in". This blog has touched upon the plight of would be X1 passengers at the Weasenham Lane stop, west of Wisbech several times before. A series of incidents have meant that over the past 18 months or so, the stop has found itself bereft of a service due to diversions, usually without any notice to warn prospective passengers. 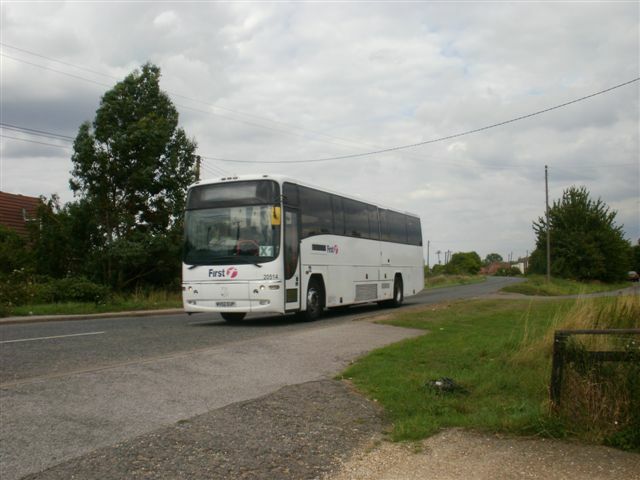 A driver who was on the route today says : "Taking the correct route out of Wisbech today, as always, I approached Weasenham Lane and an elderly lady was frantically waving to me while crossing the road from the Wisbech bound bus stop. This is what she told me - She had been dropped off at the proper bus stop for the Peterborough bound service, only to see it come from Weasenham Lane and disappear away from her. She then decided to cross the road and catch the next bus into Wisbech,only to see that turn into Weasenham Lane ! At the same time, I was coming the opposite way from Wisbech. She was very pleased that I stopped and waited for her. The official line is that 'The Council' has not provided temporary bus stops for the diverted route, so 'The Company' has informed drivers not to use the stop! In olden days, 'The Company' would have put out temp dolly stops themselves!!!" Well thanks to our man there for an explanation at last - all a matter of "that's not my job" by the sounds of things. To those who are unfamiliar with the stop we are referring to, it is on Cromwell Road, just before the Weasenham Lane junction. This junction is where buses using the unofficial diversion via the A1101 Churchill Road and then Weasenham Lane rejoin Cromwell Road and then head for Peterborough to the dismay of any poor soul standing waiting. As I have mentioned on recent days, the number of services using the correct route westbound varies dramatically from day to day. Out of a possible 14 services I viewed today, only five travelled this way. Up until lunchtime today, things seemed to run fairly smoothly. K14 with 37565 was then involved in an incident at Terrington St. John at about 12.30 when its driver clipped the wing mirror against the bus shelter and it slammed back into the doors breaking some glass. 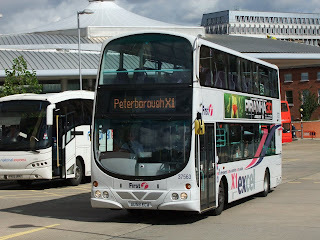 This meant that the onward service to Peterborough was curtailed and the return journey at 13.35 ex P'boro to Lowestoft (where the bus is garaged overnight) did not operate in its' entirety. After repairs back at Lynn, a familiar face took 565 back to Yarmouth empty, thus giving them an extra vehicle tonight. This is not the first time this has happened recently and Doreen reported a similar wing mirror incident a couple of weeks back. Afternoon punctuality went out of the window (sorry !) and 37160 was seen scuffling through Walpole Highway on K18 at 17.16, 40 minutes late. Going the other way 37564 on K4 hadn't appeared by 17.30 (due 17.03) and it may have terminated at Wisbech, before returning to Yarmouth. L8 had 37567 for the first return trip, but 37569 was substituted at Lowestoft. this was 15 late on the 18.50 westbound from Lynn. 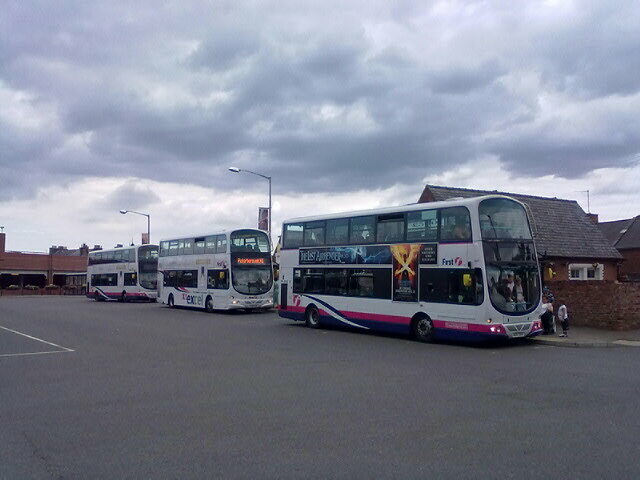 Y13 had three Geminis on it today, 37572 to Lynn, 37570 forward and later 37156 out of Lowestoft. 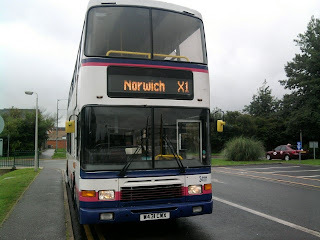 Stan says " I was waiting in Norwich for the 10.50 X1 to Tesco at Gunton. One of those horrible coaches turned up !! I didn't get on as I have a little problem climbing the steps. I returned to the bus station to catch the 11.20 X1 and (you've guessed it !) another coach with steps appeared". Des also remarks that passengers waiting for a low floor service would have been frustrated by the use of 20126 on K2 (horrible ? oooerrr Stan !) and then 20514 on K3. Stan finishes by saying "I ended up getting the 11.40 X2 to Lowestoft and then an Anglian 601 to Gunton Tesco". In case you were wondering about a lack of sightings on my sidekick Bruce's part, I ought to explain that he's been enjoying the delights of West Wales for a week and his in-laws have been left in charge of the menagerie at Boskoop Farm. Thus I have been kept informed of the number of the Dart on the locals at Haverfordwest instead ! This has meant that sightings have been less this week on the X1, but with help from staff, I've been able to piece together the goings on. Bruce returns on Thursday afternoon, so normal service will then resume I expect. So what of Tuesday ? Well it looks very much like 20107 remained at Yarmouth and instead Y6 unusually had a B7 in the shape of 37157 (seemingly quieter at last) while Y7 was a rejuvenated 37570, Y9 began with 37569 but as this was due for servicing so 37564 replaced it at Lowestoft for the 15.55 to King's Lynn and Y13 was 20126 all day - it was at least 12 late at lunchtime, but was on time this evening. Lowestoft for its part produced 37572 for L8, which today managed to work the full turn, but as on so many occasions had to call in at Vancouver Avenue at 21.40 for a top up of adblu. L10 had 37566, L11 37160 and L12 37565 sporting a new offside ad for BT. Turns out that the current campaign for BT has been so successful in encouraging people to sign up for Sky Sports etc. that a further supply of ads were commissioned and are now being applied to the fleet. 37573/9 and 37159 already had this advert and now 37565/9/70/72 7 37160 are adorned too. 20514 seems to be a permanent fixture on K3, but anyone wishing to enjoy the luxury should be aware that 37571 may well be back on Friday. The timetable was pretty much adhered to today and slight delays were caused by a temporary set of four way traffic lights at Terrington St. John crossroads. Not a good day for the B9s today. 37565 was stopped at Lowestoft, presumably to sort out its problems we related yesterday, 37570 was likewise at Yarmouth, 37571 still awaiting MOT and 37573 out of service at Volvo. This meant that when 37572 on L8 was unable, through late running I would think, to turn round at Lowestoft to do the 15.25 to Peterborough, 'The Beast' was procured to work it instead. This was 20107's first X1 run since July 26th. Two other coaches were in use today, being 20126 on K1 and 20514 on K3. The shortfall at Yarmouth seems to have been alleviated by 37156 being sent from Lowestoft and this did Y13. Punctuality was all over the place today. K2 with 37567 was almost 2 minutes early at Walpole Highway on the 08.31 to Lowestoft, but due to an accident closing the A47/A17 Pullover roundabout for a couple of hours from 15.00, it was 32 late through Wisbech on the 16.18 to Peterborough ! K3 with 20514 was seen departing Wisbech at 17.13, so only 25 late and after this the situation improved. 37566 on Y6 was boarded by Jamie R at Walpole Highway running just 3 minutes late on the 18.03 to Peterborough. At lunchtime, 37577 on K15 12.45 Lynn - Peterborough was in excess of 18 late, by which time my sandwiches were calling. Eagle eyed Marc from Peterborough reports 20514 as having full First Eastern legals and thus poses the question, will it be here for longer than its anticipated spell replacing 37571 ? 20126 has never been a common sight on the X1 - until now that is. Here it deputises for 37570 on the 08.30 from Yarmouth today, seen at Walpole about 5 late this morning. Thanks to Des for the tip off. I made a trip up to Walpole Highway at just after eleven this morning to view the 10.10 ex Peterborough, the reason behind this being that it 'dies' at Lowestoft and then goes empty to Yarmouth and I just had a hunch that things might get interesting. The 10.10 passed by with 37566, so nothing too exciting there. As services cross here, I waited to check the 08.30 from Great Yarmouth and was very surprised to see 20126 heading towards me. Our man on the spot explains : "Yarmouth has four X1's to stay on a Saturday night and needs three of these for service on the Sunday. On Saturday, a Lowestoft driver operated a Yarmouth shift that started in Lowestoft but finished in Yarmouth. 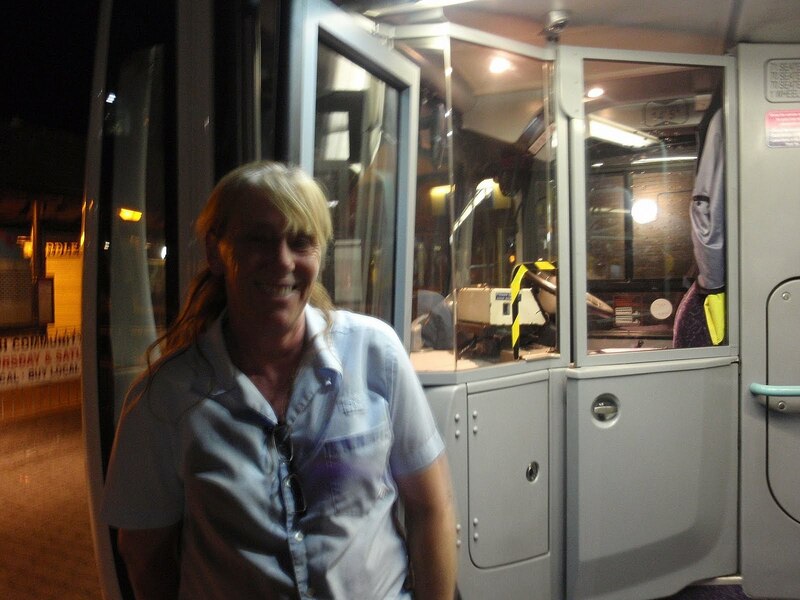 To get him home, he was allowed to drive the bus (37568 off K18) to Lowestoft to garage for the night. Then 37570 was garaged at Yarmouth with a defective Digi Tacho. So, only two deckers were available for the Sunday service". Well I must admit I would never have guessed what happened there ! While 20126 was the only unusual vehicle to appear today - and it did indeed complete the turn which finishes as the 21.10 Peterborough - King's Lynn, viewed by Rob H and myself after a beer in the Lattice House ! - there was almost a Gemini failure too, Stan (a new name on this blog) explains "the driver of the 15.48 to Peterborough (37565) couldn't get the bus to reverse from the bus bay in Lowestoft bus station. He revved the engine for a few minutes and it moved, but only to the roundabout near the police station. He had to wait to give way to traffic and went to pull away, but the bus went very slowly and was shuddering. The driver managed to get the bus off the roundabout and parked at the side of the road. He told all the passengers that the onboard computer was reporting an air pressure fault on the brakes and that he would have to reset the computer to rectify it. He switched the engine off and waited for some minutes. He then started the bus up again and away we went. At Tesco he stopped for passengers and the bus would not pull away at all. The driver stopped the engine and again after some minutes started the engine and away we went. The bus changed drivers in Yarmouth and I travelled to Norwich with no further problems". Punctuality was average today with a maximum delay of 12 minutes noted. I suppose in any job, there is always a shortage of manpower at peak holiday times, particularly if rostered staff are then taken ill. The prospect of replacing them at awkward times like weekends can be unlikely. Today K17 suffered in that the driver due to work the 16.32 Lynn - Lowestoft was unavailable, so 37576 retired to Vancouver Avenue and I am assuming that as a result there has been a gap in tonight's service, with the 20.48 Lynn to Lowestoft being likewise cancelled. 37570 passes the site of 37571's accident, just east of the Thorney bypass on the late running L12 today. Things pretty much returned to normal punctuality wise today, although L12 with 37570 was seen at Thorney bypass roundabout at 13.25, so was around 20 late heading east. 20514 was out today on K3 as usual. 37157 was spotted heading into Lynn on Y13 tonight and is still very noisy. 37563 also sounded very rough tonight on Y6 and shortly after leaving Lynn for Lowestoft at 20.35, had to make an extra stop at Vancouver Avenue for fuel - as I've mentioned before, Y6 and L8 stop here on an almost daily basis. The planned Royale / B7 swap may take place this weekend, but it has been postponed before of course. As the reliability of the B7s leaves something to be desired, it looks as though they will not be appearing on the X1 yet, although it is believed to still be in the pipeline. 34108 is likely to stay at Lowestoft along with 34109 and there is just a slight possibility that the latter may still get its tacho calibrated and be an X1 emergency candidate. 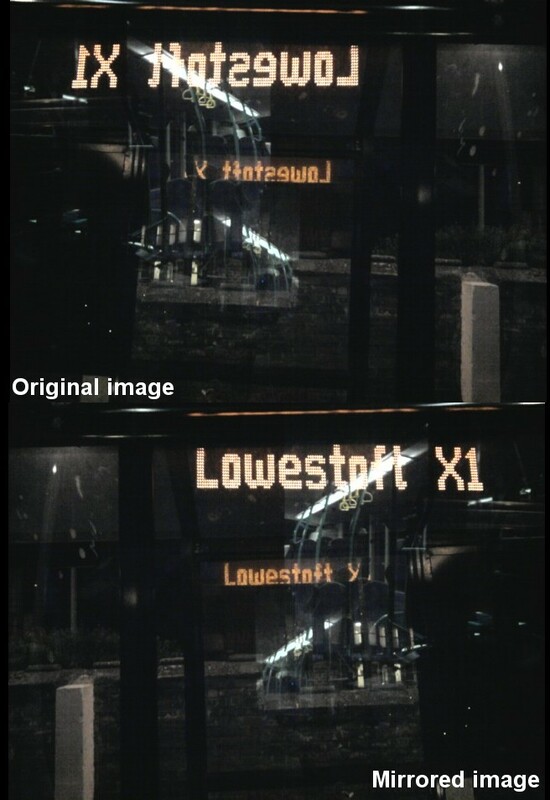 This may occur because 20107 should be leaving Lowestoft for Yarmouth after its safety service and this would then leave Lowestoft short for X1 substitutes. Late tonight 37564 took the last Lowestoft to Lynn (K19) instead of the rostered bus, 37572. Michael Bryant reports 20126 having a day out on a private charter today. He spotted it parked in Norwich under the Magdalen street flyover. So far I've put on three files showing Monday to Friday, Saturdays and Sundays. I will be adding other files of interest when I get time. It's amazing how things on the X1 can go from being quite comfortable to chaos in a very short time, but today was a good example. From my vantage point on Nene Quay in Wisbech, L11 with 37576 passed by bang on time to Peterborough at 11.20 and L12 came next with 37569 just 4 late. Meanwhile, at Lowestoft Tony was a passenger on K1 which was 37570 and this arrived late - possibly due to an Acle Straight A47 accident, just as the second part of K1 departed with 37566 which had been inserted as spare bus. This then led to the laying over arrangement being applied, so at Lowestoft K2 with 37563 was changed at 12.25 for 37570 off K1, then K3 with 20514 was given 37563 for the 12.55 and so on until 37567 arrived at 14.10 on Y6. Things had then eased and Y7 with 37572 continued on its turn and 37567 retired from the X1 for the day. Back at King's Lynn mid afternoon was the time when things went badly wrong. L12 due to depart for Lowestoft left almost on time at 14.05 with 37569, but then Y13 failed to appear from Peterborough. With passenger numbers swelling and 37566 having arrived on K1 (see above) to do the 15.15 to Peterborough, through passengers were ejected and 566 then formed Y13 14.32 back to Lowestoft, but departed 56 late at 15.28 !! This then left a hole in the Peterborough service and eventually 37160 arrived from Peterborough on Y13 incredibly late and this then became K1, departing Lynn at about 15.45 (30 late). It was seen leaving Wisbech 27 late in a thunderstorm. What a business !! The upshot of all this was that 20514 had suddenly found itself on a diagram which ends at Yarmouth, so it was taken off K4 at Lynn at 19.27 and 37563 off K3 was pinched to do K4 at 19.35 to Lowestoft. This created a situation where 563 had started the day on K2, dropped down to K3 and ended up on K4 which is something I can't recall happening before. Other evening changes involved Y9 with 37568 which then took L10 19.50 Lynn - Peterborough instead of 37564. Y13 returned with 37156 instead of 37566 which surely must have been a bit disorientated. 156 had done K14 earlier and with the current schedule there is a 28 minute layover between K14s arrival at Lowestoft at 18.20 and the departure back to Peterborough of Y13 at 18.48. It was late arriving at Lynn though at 21.49 which meant the last Peterborough was late. Syd reports that the bad weather meant that yesterday's reliefs for the Lowestoft Airshow were not repeated. Whilst all this was going on, 37573 which worked Y6 on Thursday was sent to Volvo for engine repairs. 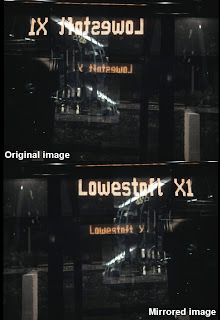 "Hi Gerard, A few extra snippets, plus a photo of 20514 departing on the 1255 X1 from Lowestoft with the blinds in use ( taken by James Race under duress from me ! ). Firstly 34108 wasnt intended to be taken off X1s, it needed its wheel nuts re-torqued, but was slightly late in due to something going on in the town. Despite all hands to the job it wasnt quick enough so 37565 deputised. 34108 went off on the 1513 ser 99 to Southwold and promptly broke a window so that was the end of its days work. 20126 was supplied for the 1725 short to Gt Yarmouth, but left full to the brim at 1720, followed by 32207 a few minutes later. Incidently the 1710 ser 1B to Martham also joined in double vision by leaving at 1715 and 1725, both with B7/Presidents. Not to be outdone the 1723 X2 also doubled up with departures at 1730 and 1740!! This left a bit of a bus shortfall so 37566 was 'borrowed' from X1 (Y13) on arrival and sent off on the 1810 Ser 1 to Martham, and stayed on the diagram working the 2110 ser 1 as well. Its place on the 1848 departure fell to 37574 after one of the worlds fastest re-fuel/sweeps ever seen. 20107 is off having a safety service at Gasworks Road so may not be out Friday". Thanks to Syd for this information. The annual Lowestoft Airshow is on currently and Sam thinks this may be partly why two B9 Geminis were seen on the X2 route today. Michael Bryant saw 37564 which worked the 06.55 Lowestoft - Norwich, a short to Beccles then the 10.10 ex Norwich. 37565 was then seen on the 10.38 from Lowestoft, meaning that at some point 564 & 565 passed each other - a definite rarity for the X2. 34108 having recovered from its misdemeanours in the early hours was used on Y7 06.10 from Yarmouth, but this afternoon it was swapped for 37565 after its X2 jaunt. Timekeeping was very good today, although there was a blip this evening. B7 37159 on L10 19.50 King's Lynn - Peterborough was 10 late going west and 37563 on L12 was very late from Lynn on the 20.50, so maybe this turned round at Wisbech ? Loan Paragon 20514 was again used on K3 today, this time with its destination screen in working order. For the first time since the closure of Nene Quay in Wisbech northbound due to the flood defence work, four consecutive X1s passed by this route this afternoon. These were the 14.18 departure to Peterborough (K17) one minute early with 37578, K18 with 37160 4 minutes late, K19 with 37570 on time and K1 with 37567 a minute early. The driver of K17 was well in command of 37578 and this was on time at Walpole Highway at 14.03 which very few services ever manage. Bruce photographed 20514 heading for Peterborough at 16.40 through Walpole this afternoon. Treble trouble ! A trio of Geminis at King's Lynn bus station today - thanks to Andy James for the picture - 37158, 37572 & 37157 on K14, K19 & K18. 158 appears to be loading, but how far did it get ? May be only Vancouver Avenue as 37159 replaced it at some point ! Well having requested sightings of Royale 34108 yesterday, it obliged itself today by replacing 37564 on L8 at Lowestoft. 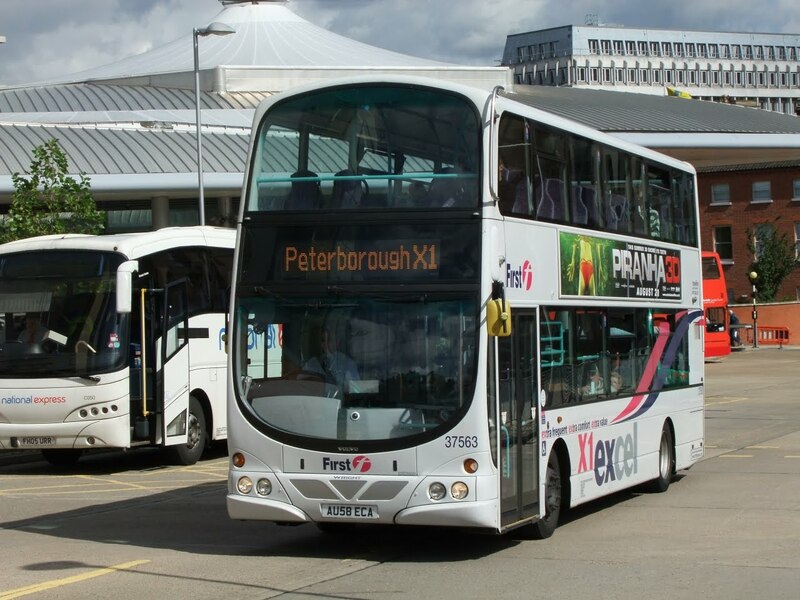 This was its first appearance at Peterborough since 6th July and it seems to have been out of traffic for a few weeks, as Michael says it has been absent from the X2 as well. Its journey was not without incident however and our man in the know reports that it ran out of fuel at Hopton at some ungodly hour after midnight. This afternoon, K18 10.55 from Lowestoft which was 37157 arrived at King's Lynn 35 late accompanied by K19 and 37572. 157 departed Lynn at around 14.50 and was viewed by Mister C in Queensgate at 15.57. Another B7 was also lagging behind schedule before this when K16 with 37156 was seen leaving Wisbech Horsefair 17 late at 14.05. It headed for Peterborough down the unnecessary diversion via Churchill Road. In between the two B7s came K17 bang on time with 37575, running correctly via Nene Quay. 37573 also took this latter route this afternoon on K1 being 20 late, this one was viewed at Queensgate at 16.57 by Tony. K2 with 37568, which of course was late to the tune of 23 minutes also travelled via Nene Quay. Today's big event was the use of Paragon 20514 on K3. It was viewed by Bruce and Rob B and was 23 late at Wisbech for the 08.56 to Lowestoft, due to 'technical problems', These can't have been too severe though, as it was only 7 late this afternoon. There was a swap at Lynn tonight with 37567 on Y6 20.35 to Lowestoft being replaced by 37565 which had just arrived on L11. Tuesday August 10th 2010 ~ Yes It's All Low Floor ! One of those days that management dream of occurred today, that's right, an entirely Gemini operated service. Not a B10M in sight and definitely no Royale - has anyone seen 34108 in the last few weeks ? More frustrating for some was the steadfast refusal of 20514 to appear !! It wasn't all without incident however, as if the X1 ever is. Early evening was a mess with K3 which had started the day with 37577, appearing 25 late at Walpole with 37159. There was then no sign of K4 and passengers had to hang on for 37160 on K5. This was explained by 37563 on K4 being swapped at Lowestoft for 37156, and I admit I assumed, (wrongly in fact), that it had lost time hand over fist as B7s are prone to do being still limited to 50mph. In fact 37156 arrived near enough on time, but on arrival at Lynn, it was taken off K4 and sent out to Hunstanton, all because 30900 (I think it was) had suffered from diff collapse and had to be towed in. K4 resumed at 19.35 from Lynn to Lowestoft with 37574 which had just come in on the terminating Y9. It is possible that the driver shortage was the reason for K4 not running west of Lynn. As I mentioned, K3 began with 37577, but this was taken off as it needs an MOT and I think had gone for a chassis wash this evening. 37573 seen departing Wisbech yesterday with the 20.00 to Lowestoft and still with broken advert. Rob Brooks. Well as one might have expected, the demise - untimely or otherwise depending on your view - of 20127 has resulted in the transfer to Great Yarmouth of 20107. Thanks to Grahame and Mr. A.N. Other for the info here. 20121 made its predicted sharp exit from King's Lynn today, firstly to Norwich and then back in its driver training role at Yarmouth. 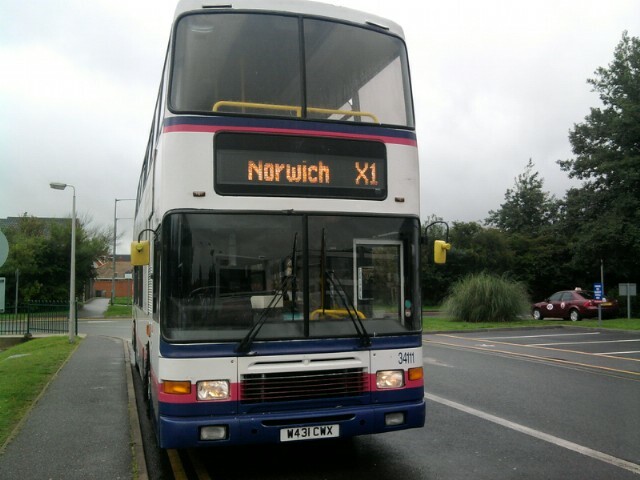 This is because 20109 is currently requiring attention and 20121 is expected to return to Norwich once this has been completed. A sense of anticipation was evident today, but 20514 refused to play ball and remained at Vancouver Avenue all day. 37571 has moved on to number 1 pit here now for attention. 37157 K16 1348 Wisbech - Peterborough a1348 still being noisy, but got someway to go to rival a real Class 37 for noise ! Elsewhere 37156 did the Lynn to Lowestoft leg of K18 before doing the 12.08 X2 from Lowestoft to Norwich and 37566 is believed to have relieved it. There was a swaparama of B7s today with 37158 doing K5 but later giving way to 37159 and 37160 doing Y6 until 17.45 when 37158 took over. 37160 heads for Lowestoft this morning on the well loaded 08.50 from Peterborough. Running 22 minutes behind schedule, 37572 on the 08.30 Great Yarmouth - Peterborough approaches Walpole Highway this morning. 37156 & 37157 enjoying a day off at Vancouver Avenue today. An idea of the mileages now being accumulated by these vehicles can be gauged by the fact that 37157 had run just 30 miles short of 2,000 this week alone. I mentioned briefly in Saturday's blog that 20121 was to be used on a private excursion today and in fact both this and visiting Paragon 20514 were utilised, it being the 'First' King's Lynn annual outing. Not sure of the destination this year, but both coaches returned OK late in the evening. Something else I forgot to mention in yesterday's excitement was the cancellation of the 19.50 King's Lynn to Peterborough (Y10). 37575 arrived from Lowestoft on time, but was then parked in the middle at Lynn bus station because of a shortage of drivers. The waiting passengers and a sizeable number there were too, then had to wait an hour for Y13, the 20.50 departure which was due to be 37157, however, this didn't go through either and 37575 was restarted to take Y13 forward. I began to think similar circumstances had caused the cancellation of the 10.50 King's Lynn to Peterborough today (08.30 ex Yarmouth), but it eventually arrived at Walpole Highway 22 minutes late with 37572. On its return the driver had managed to reduce the delay to 13 minutes. All five B7 Geminis were at Lynn overnight, but only one found itself on the X1 today, this being 37160 which did the 08.50 King's Lynn to Peterborough and 10.10 thence to Lowestoft. Upon arrival it went light to Yarmouth as booked. 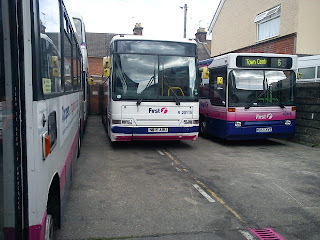 Only two Lowestoft B9s appeared today, these being 37563 & 37567 and the other 8 turns were all Lynn buses. Wall to roof carpet would appear to one of the luxury features of Paragon 20514 seen here this evening alongside comfy old 20121 and a King's Lynn local Dart on the left. B10M 20126 flying over the A47 flyover at lunchtime on L9 11.05 Peterborough - Lowestoft with Des behind the wheel. Photo by Bruce. The timetable seemed to be adhered to fairly well today and most services seen were heavily loaded. 37569 turned up (as expected) on Y6 05.50 from Yarmouth and it seems to have set a new record for retaining the same advert. The Spring Easy Jet campaign poster fitted on 2nd January this year is still in situ. What makes this more amusing is that the later Summer campaign included an advert for similar flights to Malaga, Faro & Alicante, but £1 dearer than those advertised on 569 ! Still at least the whole advert is still there unlike 37573 which still has only part of its Summer Easy Jet ad in place. Almost all the Easy Jet ads have now been replaced by one for the film Piranha in 3D. Des was the driver of L9 today which was 20126 and Bruce was out with the video camera, however, should he have done the same for Y13 yesterday ? More anon. For the second day in a row 37568 was absent yet again, although to be fair it may have done L12 as this was not seen, but knowing 37568's reputation, 37564 or even 37565 were surely a better bet. The latter pair should both have been at Lowestoft this morning, whereas 568 went into Yarmouth on Thursday evening and wasn't seen on Friday. Incidentally, regular readers may be a little confused by my reference to L9. This is because on Saturdays diagrams 9 & 10 change origins with Y9 becoming L9 off Lowestoft garage and L10 starting at Yarmouth as Y10. The reign of 37562 on the X1 came to an abrupt end in the early hours of this morning when it came in to King's Lynn on Y13. Tonight Robin reports it at Padmore Street in Worcester ! Turns out that Richard took it this morning, returning with Kidderminster Midland Red Paragon coach 20514 which is to be for X1 use for the next three weeks while 37571 is worked on. Now who could have predicted that one ? There was another unexpected coach at King's Lynn tonight too, when 20121 - far from looking like a driver trainer - turned up in preparation for a private hire job tomorrow. It is to be whisked off back to Norwich on Monday though, before anyone gets any X1 ideas ! ......so King's Lynn went completely low floor for a few days then. There was a parade in Swaffham today to welcome back RAF Marham's II (AC) Squadron and supporting units which had been on duty in Afghanistan. This didn't affect X1 punctuality quite as much as expected, but 2,000 people did descend on the Swaffham Market Place area for a while. Peterborough bound from Wisbech was 37567 on L12 just 8 late on the 11.48, 37562 on Y13 11 late, but then there was a gap of nearly an hour with K14 passing Bruce at 13.11 (due 12.34) 37 late. K15 had a B9, by process of elimination although not viewed, this was 37573 and was 22 late. K16 with a revived 37565 (see yesterday) was 11 late at Walpole, but for some reason 18 late from Wisbech. FST ensued with K17 37574 8 late, K18 37157 16 late, K19 37577 13 late, K1 37569 7 late and then things got back to normal with 20126 on K2 (16.18 Wisbech - Peterborough) and 37160 on K3 both on time. Eastbound there were major delays mid afternoon, easing later. There were two swaps, K4 changed 37564 for 37563 at Lowestoft and Y6 exchanged 37578 for 37579 at Lynn at some point. Thanks to Bruce, Rob B and Tony amongst others for recent sightings. Thursday August 5th 2010 ~ Another Funeral ? 2010 continues to be a very black year for the surviving B10M coaches. Yesterday's incident involving 20127 may turn out to be terminal. It was explained to me this evening what had happened yesterday and, not being technically minded I only took half of it in, but it was something to do with (I think) the timing belt disintegrating and smashing the crankcase. Sounds very serious to me and tonight 127 was dumped at Rowan Road having been towed there at some stage and looking very defunct parked next to 20118. This means then that only 20107 & 20126 are now still available for X1 standby. A pleasant surprise this morning was 20126 coming out to play on Y9 where 37568 had been expected. Timekeeping was erratic today and there were several swaps, something which tends to happen every other Thursday as this is when several B9s fall due for servicing. Tonight 37160 on the 16.15 from Lynn to Peterborough (K3) managed to lose 41 minutes and was only three minutes in front of K4 with 37566, itself around 15 minutes late. K5 with 37574 was also around 15 late when seen by Bruce and even into the early evening things were late, 37568 which deigned to appear on the second part of L8 was 15 down leaving Lynn on the 18.50 Peterborough. Earlier L8 had been viewed with a Lynn B9, believed to have been 37572. Another swap at Lowestoft saw 37576 changed for 37579 on Y7 and 37577 on K15 was taken off for servicing at Lynn at just before half three with 37570 returning to service on the 15.32 departure to Lowestoft. 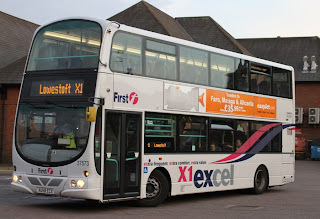 First thing this morning K19 (37573) was seen at Walpole 15 late and it was still 16 late this evening. Strangely 37562 was switched from its usual K17 turn and did K18, while Lowestoft based 37157 was rare power for K17. This evening 37565 expired at Swaffham on L10 amidst much acrid smoke and a fitter had to attend and limp it back to Vancouver Avenue. 37160 which had just arrived at the bus station on the late running teminator K3 was requesitioned to work L10 forward to Peterborough at 19.50. This fine illustration was spotted by our man in the canteen at Lowestoft today, such a shame it wasn't on standby at King's Lynn at lunchtime ! Thanks to Grahame Bessey for this picture of 20501 at Norwich today conveying punters to Banham Zoo. 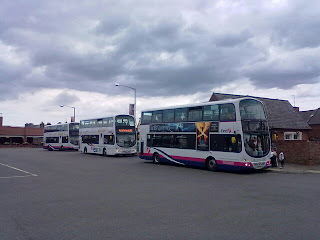 The worst case scenario (predicted by this blog) came to fruition today, when King's Lynn ran out of buses. 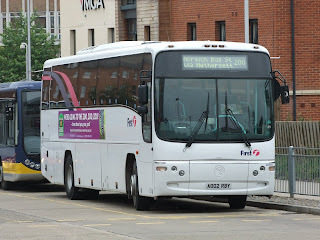 This phenomenon had already taken place at Lowestoft last week, when passengers were taken off collision damaged 20107 and transferred to a Service 1 as there were no suitable spare vehicles. 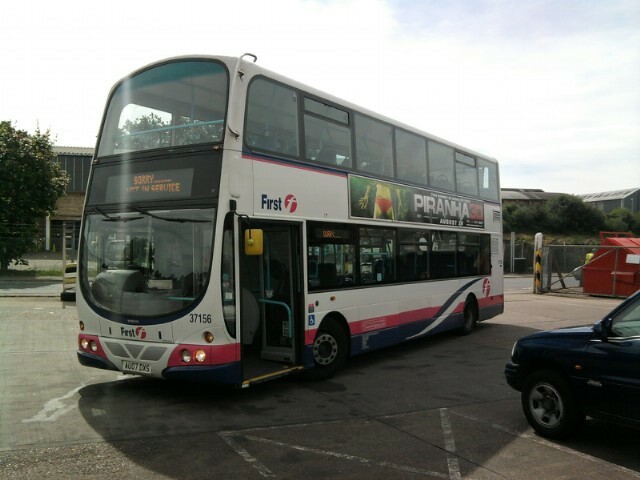 Today B10M 20127 expired at Lynn on K16 with oil and exhaust problems at just after 13.00 and as a result nothing could be found for the 13.15 to Peterborough **. Whether something came to the rescue to work the 16.02 to Lowestoft is unknown, Bruce reported 37570 on the forecourt at Vancouver Avenue, but still with white off road ticket in the window so this didn't look likely. 37158, the only other possibility was on Hunstantons at 15.00, but could possibly have been purloined if all else failed. At Lowestoft, 37564 & 37569 were both stopped today and 37160 came back home on L11. Meanwhile Des says "Have spotted 20107 in Norfolk Showground, Mon & Tues, on Scout jamboree work". Wot ?? How dare they borrow it for such trivialities ! As if the situation at Lynn wasn't bad enough, it was further rubbed in by the appearance of Paragon 20501 on a service from Norwich to Banham Zoo - see Grahame's photo. I think the X1 ought to recall a few players in from loan clubs - hark at me and the football hasn't even started yet. **Oh Dear What Can The Matter Be, Seven Old B10s Locked Up at Saddlebow, They Were There From Monday to Saturday (Sunday actually !) And Nobody Knew They Were There - well apart from Bruce that is and actually there are only six but it doesn't sound as good. A funny old line up at Vancouver Avenue tonight. 20127 is next to 37571, note the absence of First logo on the front, while a rather sickly looking Dart just visible on the right carries a rear advert which says "Thinking About Retiring ? ", which in view of the buses dilemma I found quite amusing. Apologies for the rather blurry pic. Yes the advert chaps were at work overnight and at last a new nearside advert for the Piranha film in 3D looks like replacing some of those 'Letters To Juliet' ads which seem to have been around forever. K14 to K19 all went over from Lynn to Lowestoft without incident, but K1 with 37576 was swapped for 37157. The B7 had come from Yarmouth this morning on the short Yarmouth - Lowestoft leg of Y13, but was changed for 37565 off Lowestoft depot. Whether 157 had time to be serviced between arrival on Y13 at 08.10 and departure on K1 at 11.55 is open to question, but it would seem likely as it was due today. The fun then continued, 37578 which was 13 late on K2 at Walpole came in to Lowestoft and was changed for 37576 off K1, K3 arrived with 37160 which was then put onto the 13.08 X2 to Norwich and was later seen on the 16.38 too (thanks to Michael and Sam for the gen). K3 predictably departed with 37578 although it was 21 late by the time it passed Bruce. Two of the absent Geminis reappeared today with 37577 coming in on L11 and 37567 relieving 37569 on Y9 at Lowestoft. 37570 is meanwhile sidelined with a water pipe fracture. The low floor monotony was broken by 20127 on Y7. All the B7s were out except 37158 which was on Lynn locals. Punctuality was hit and miss today. L10 with 37156 managed to be 23 late through Walpole westbound this morning and perhaps unsurprisingly ran via the bypass on the way back to Lynn to regain some time. I'm wondering if August can go by without King's Lynn having to resort to using a Scania ? Speaking of which 65556 had appeared at King's Lynn tonight and was receiving a tyre change. It is thought to be here to cover for a blown up Lynn example. The transfer of 37571 from Fleetwood to King's Lynn seems to have happened overnight with John W reporting it in Vancouver Avenue this morning. Latest news is that it will need various modifications carried out by Volvo, these have already been done to the other B9s, before receiving its MOT which now looks like being next week. On the road it was a quiet day with Bruce watching closely. Worst delay involved K18 14.15 King's Lynn - Peterborough which was 25 late with 37157 and K19 with 37573 close behind it. 37569 was noted on L8 this morning on Guyhirn Bank and its destination screens were not working, which is a rare complaint. 37567/70/77 were all off the road today and 20127 continued its X1 work on K1. One of our Yarmouth chaps says that 20115 is now destined to be a driver trainer, along with 20123 which currently languishes alongside 20118 at Rowan Road. 37578 working the 10.48 Lowestoft - Peterborough was on time this afternoon. Following a minor collision earlier this year, it now has a smaller than normal fleet number on the front. ... and this on a Sunday too ! P767 XHS accelerates out of Walpole Highway in some very hazy sunshine this afternoon. As I mentioned in Saturday's blog, 37571 is due to return to service soon. Jim Long and Rob Brooks both report it as being sighted at Fleetwood Dock today. On arrival at King's Lynn it will need to have an MOT, but once this is completed it will re-enter service and I am told by the man who knows these things that 37562 should then be returned to Volvo. This begs the question, will 571 be rostered to work K17 every day and more importantly, will Bruce get the video camera out to record the passing of 562 ! Whilst mentioning Bruce, I'm sure you will all join me in wishing him well as he has had to undergo some hospital treatment this week. Today was quite interesting for a Sunday for a change. Great Yarmouth produced 20127 for the 09.30 to Peterborough in preference to 37566 which should have been available. Mid afternoon observations at Walton Highway saw 37576 (doing slightly better than yesterday) only 18 late on the 11.48 from Peterborough and passing 37570 going the other way 20 late on the 14.10 from Peterborough. 37570 had been required at King's Lynn for servicing last night, but Y6 meant it went through to Lowestoft instead. No surprise then that it was removed from the 14.10 at Lynn this afternoon and replaced by another B9. 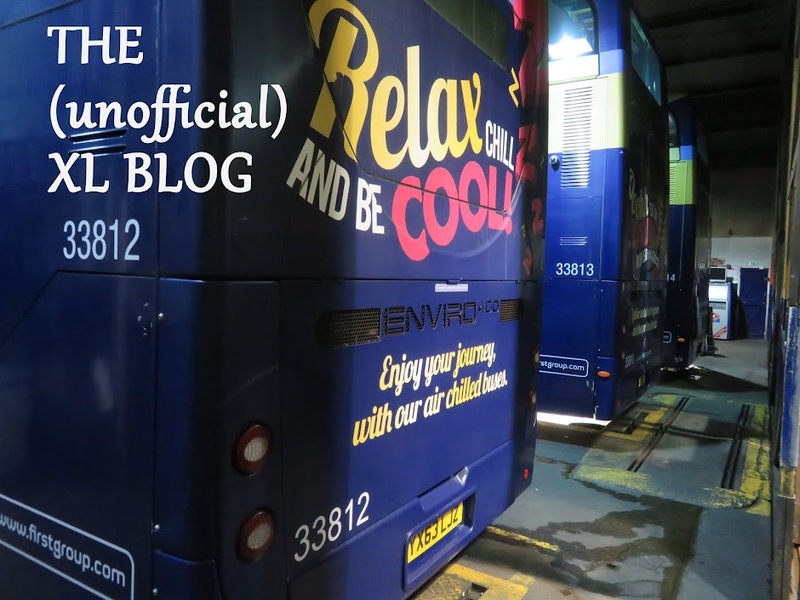 and for those of you interested in things further afield, I am currently uploading my pictures of Lothian buses I saw in Edinburgh during my recent visit. I will be adding the 'First' bus pictures soon too and there are some pretty old vehicles operating there - even by our standards. Now here's a rare sight, although some X1 s begin their journey at Wisbech, none actually terminate there - well not normally anyway. This was K2 this afternoon which was running 33 late with 37576 and the driver obviously had no intention of going through to Peterborough ! According to people in the know, the return of 37571 is imminent. It was involved in the fatal accident near Thorney at the end of May last year and has at last been repaired for further use. King's Lynn are expected to take delivery of 37571 in the next couple of days. Whether 37562 will remain is anyones guess. It is shown on the official First fleetlist, so they may have purchased it from Volvo from whence it came on loan. Today 20127 was again flying the flag for the oldies and was 11 late on K18 through Walpole Highway westbound, only to return one minute early. K2 with 37576 was heavily delayed and terminated at Wisbech (see picture). Through passengers transferred to 37159 which was only 5 minutes behind on K3 16.15 King's Lynn to Peterborough. 37565 which began the day on K1 was removed at some point and it is not known what replaced it. 37562 was on a surprising Saturday turn, it worked L8 which starts and finishes at Lowestoft. Things were thrown into disarray today by an A47 accident at West Bilney which occurred soon after 09.00. The A47 was blocked in one direction until around 11.30. During this time services were routed from Swaffham down the A1122 to Stradsett and then up the A134 to reach King's Lynn. Bruce viewed 37568 near Wormegay, roughly on time with L8 10.35 from Peterborough. Later in the evening peak, Yarmouth became virtually gridlocked after an accident on the Breydon Bridge causing more delays. 37565 on L11 got caught up in the diversion and was seen running 16 late on the 11.18 from Wisbech westbound. L12 was less delayed and Bruce says it looked very much like 20126, however, this evening L12 reappeared with 20127, obviously recovered from its failure yesterday. Somewhere west of King's Lynn, K14 with 37157 overtook Y13 with 37569, with the result that these departed Lynn in the wrong order. Bruce reports 157 was into Lynn at 14.55 and immediately filled to the brim with punters, it left not far off right time, with a few passengers left over then boarding the dealyed Y13 with 37569. Going westbound 37579 on K15 was 16 late and then K16 with 37572 lost 32 minutes leaving Wisbech westbound at 14.20 with 37575 on K17 just 4 minutes behind it. 37576 on K19 fared better being just 2 late and after negotiating Wisbech at 17.00 managed to get away for Lowestoft only ten down. 37159 was 25 late from Lynn on the 16.15 to Peterborough. There were a few swapped buses and Y6 had 37577 changed at Lynn for 37562 at some point. 37566 did the morning part of K18, but 37156 did the second leg and this failed at Swaffham at 18.00 overheating because of low coolant. Fitters attended and 37156 eventually continued.